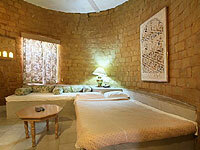 Hotel Himmatgarh Palace, Jaisalmer offers breath taking views of Jaisalmer Fort. Made from yellow sandstone, the hotel has a palatial architecture with elegant interiors. 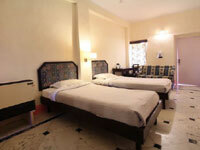 The well- designed rooms of the hotel offer modern facilities for a pleasant stay. Shopaholics can go on a shopping spree with the numerous shopping options nearby from the hotel.